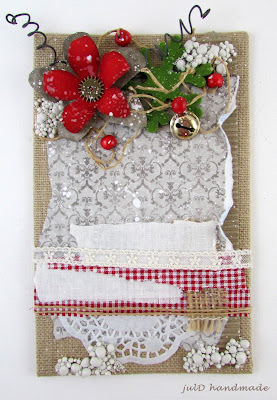 It is time to welcome our Guest Designer for our Christmas Wishes challenge. Please say hello to Ioulia of julD Handmade who was the winner of the Elements of Nature challenge. 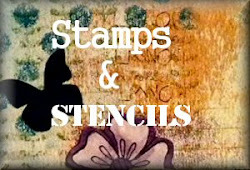 Hello, I am Ioulia (julD handmade) from Greece and I am so happy to be a Guest Designer at Stamps and Stencils. It is such an honor to be here today. Thank you so much. I loved painting and crafting from my early years, but instead of becoming an artist I became an engineer who loves to create things in her free time. So,crafting is my hobby. My favourite is clay and texture in paintings. I am impressed by new techniques and altered materials. The challenge for this month is Christmas Wishes. I decided to create a small mixed media canvas. First I made an air dry clay reindeer. 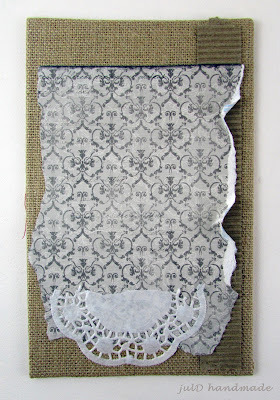 Then, I used a burlap canvas panel (14x22cm) and I stuck upon it a scrapbooking paper, corrugated cardboard and paper lace. I made a paper flower with scrapbooking paper and a gear. 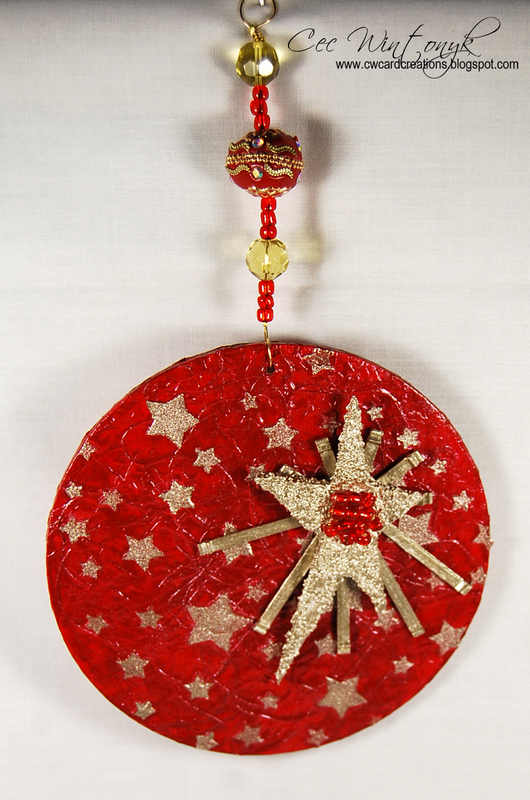 I added a felt snowflake, black wire, red wooden beads, cords, a little bell and some fabric pieces. 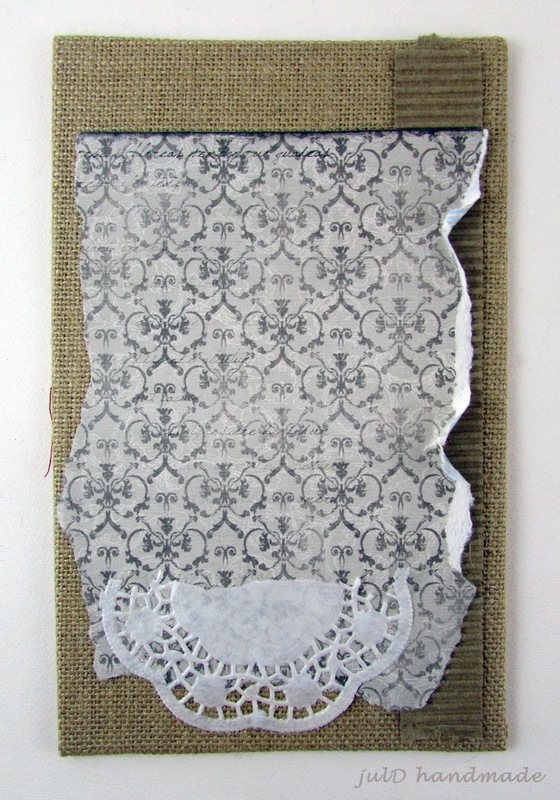 I splashed with white gesso and stuck 3d balls and a piece of lace. 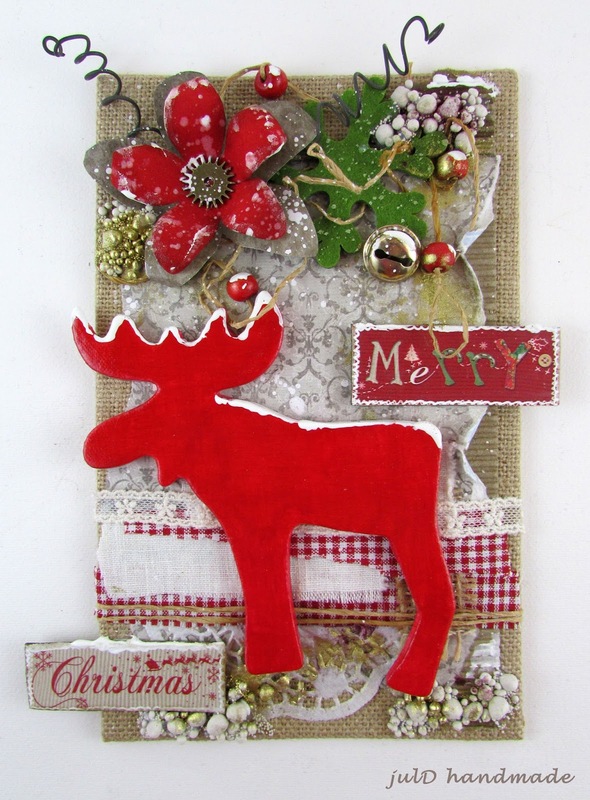 I coloured with pigment colours and I added the reindeer and the words “Merry Christmas”. I hope you like it. 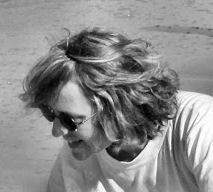 You are very welcome to stop by my blog to see a few more close ups. Thanks again for inviting me to be a Guest Designer this month. This is our last post for 2016. The Stamps and Stencils team would like to wish you a safe and happy holiday season and we hope to see you back here on January 5th for our first challenge of the New Year. 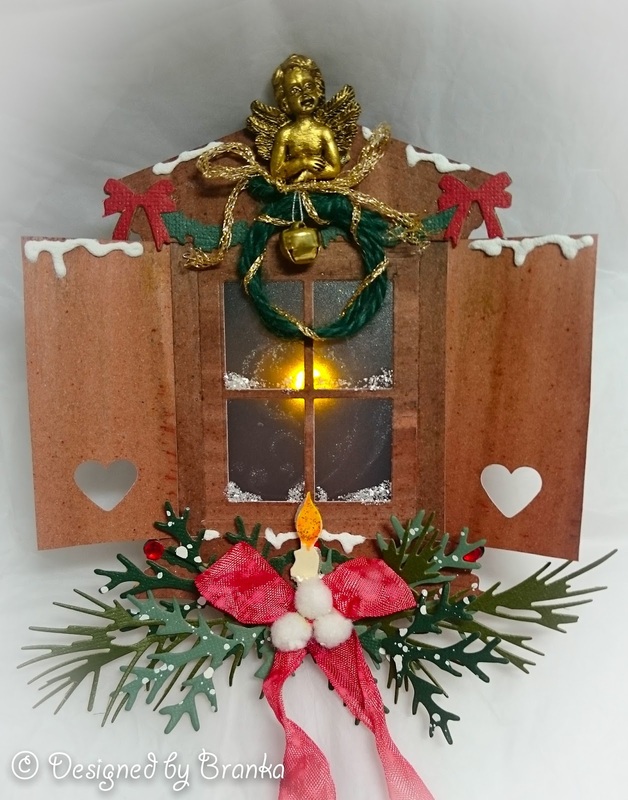 In the meantime you still have time to enter the Christmas Wishes challenge and perhaps you will even have some new craft goodies to create with. I would like to show you how to create the Dyan Reaveley's style Christmas card from start to finish. 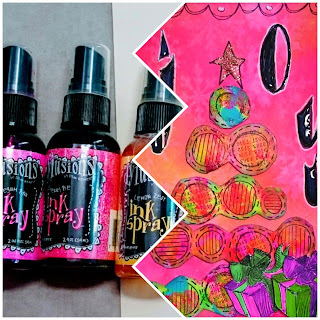 I used a 4x6 inches manila cardstock, three Dylusions ink sprays in Lemon Zest, Postbox Red and Bubblegum Pink and a spray bottle with water. I sprayed my cardstock with water and then start to spray with my inks creating puddles. Then I sprayed more water on top and let my inks to bleed. This is the result of my first layer. For the second layer, I used my Dylusions mini snowflakes stencil (Let it Snow) on top of my background and I sprayed it with water. I waited for about 10 seconds to blot it with my kitchen roll. Since the Dylusions inks are reactive with water, I achieved some nice ghosting effect here. For the third layer I decided to use my White linen Dylusions ink and my mini snowflakes stencils. This is my finished background. I used one of the border stamps from the Dylusions Around the border set and stamped it several times onto my white cardstock using my Black Archival ink. I used my Dylusions paints (in the same colors as my inks I used on the background) and I also used some of my Amsterdam Specialties acrylic paints (fluo paints) to color my stamped images. I like to use my fingers to apply the paint but you can use a brush if you want. This is the result of my coloring. I wanted to add some border on the edges of my card, so I used another border stamp from the same Dylusions stamp set. I stamped the image only on two sides of my card using the black Archival ink. I cut out my colored stamped images using my scissors and distressed the edges using the same black Archival ink. I also distressed the edges of my card. Then I started to build my Christmas tree. I wanted to achieve some dimension so I used my double sided foam tape to glued down the images. To create a star on top of my tree, I used my Dylusions stencils Starry Night to trace the star using my Fude ball pen in black. I used my Distress Stickles in gold onto my star. For the Christmas gifts, I used my Tim Holtz mini blue print stamp and colored it with my Dylusions inks and a brush. I added some white highlights onto my border using my Sharpie white poster pen. 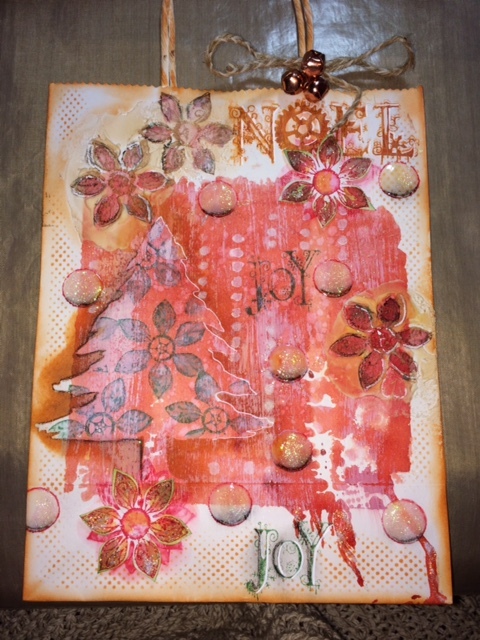 Thdn, I stamped the word JOY using the Dylusions Dy's Alphabet stamp and my black Archival ink. I outlined the stamped letters with my white pens. I wanted to create some more dimension so I added the Glossy accents on top of my stamped letters. I decided to use my black cardstock for the card base but you can use any color you want. 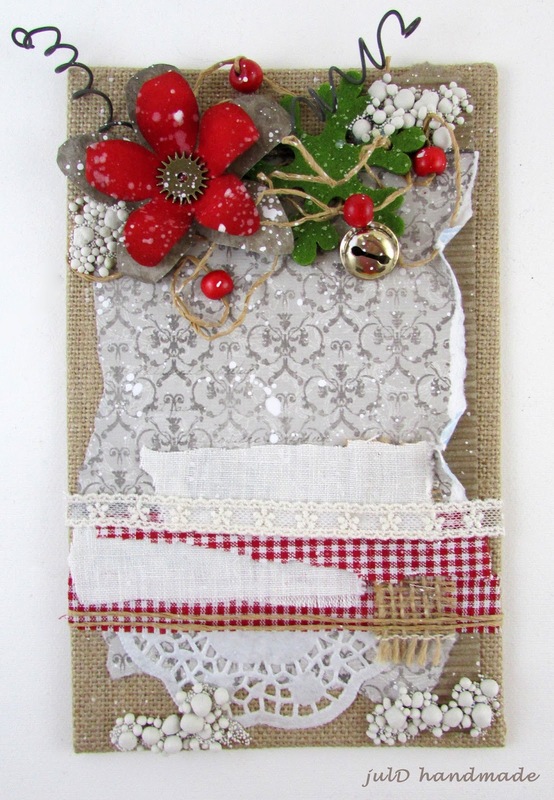 I hope I have inspired you to create your mixed media piece and to join in our 'Christmas Wishes' challenge here at Stamps and Stencils! Sorry to be a tad late but I guess late is better than never so here are the winners from the Tags, Bags and Boxes challenge. The Design Team has chosen this altered bag project as the Winner for November. This cheerful bag has a wonderful non-traditional colour palette and will be a keepsake for the recipient along with the gift it holds. Congratulations Leanne. 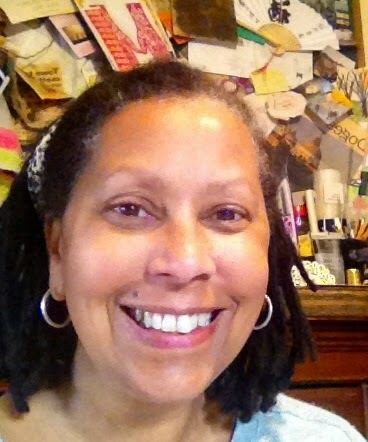 Cec will be in touch with you shortly to discuss your Guest Designer spot. Congratulations ladies. Please email Cec at cwcardcreations@rogers.com to claim your Top Pick badges. Have a wonderful and safe holiday season. This challenge will be open until January 4, 2017 at 20:00 UK time. 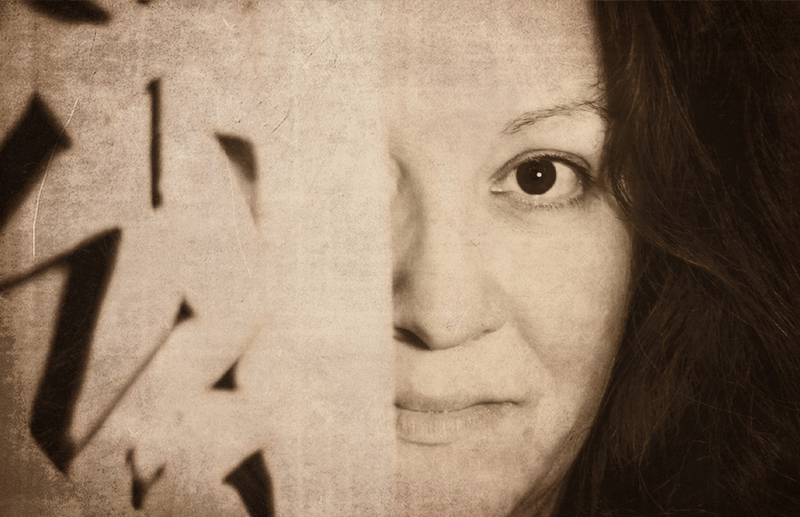 Please say hello and welcome to our Guest Designer for this challenge. Kerstin whose blog is Scrapbook Dreams was the winner of our Autumn Colours challenge. 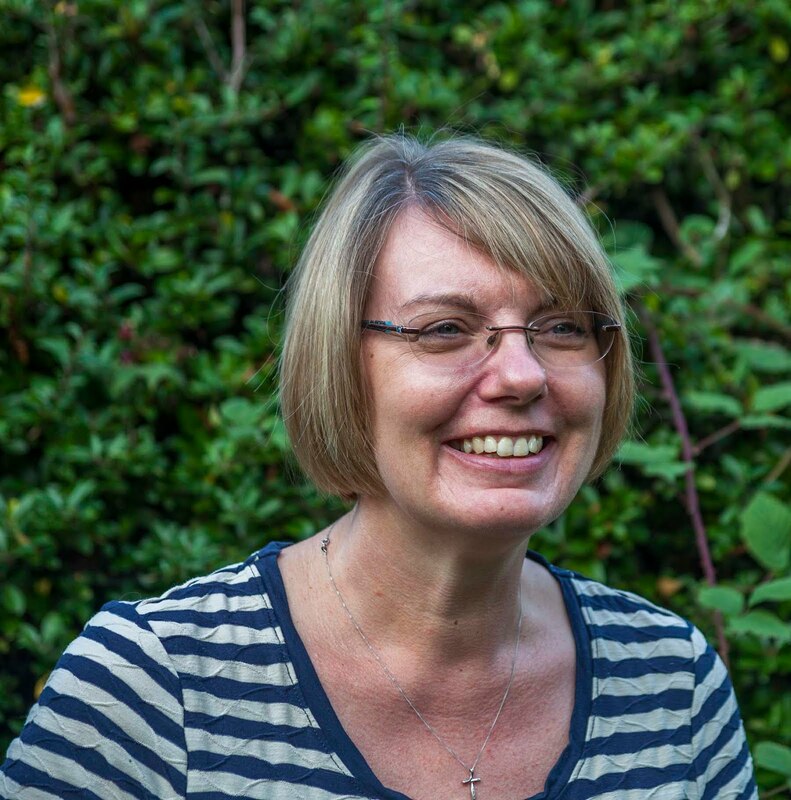 "I was so pleased to be asked to join you all as a Guest Creative Guide here at Stamps and Stencils. My name is Kerstin -Inga Peters, but I am more known as simply Kerstin F.
I have been creating for many years now, always in search of new techniques and yet unexplored territory, because I love to try out, products and ideas and share inspirations, because it's always an adventure, a discovery tour, which I like to take my friends and all the other crafty people with me. My favourites are colours and textures with a view to the small things, details and a big faible for 3D projects or elements. With Scrapbooking, Home decoration, Art Journaling in combination with Mixed Media Style I have found 'my' perfect favourite genres. My creations are always a little bit magical, romantic, sometimes funny, but always made with heart and mind." "This month the challenge theme is "Tags, Bags & Boxes". 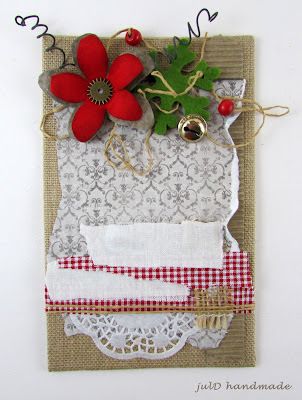 I decided to make a tag in vintage style, Mixed Media ART a little christmas inspiration for you. 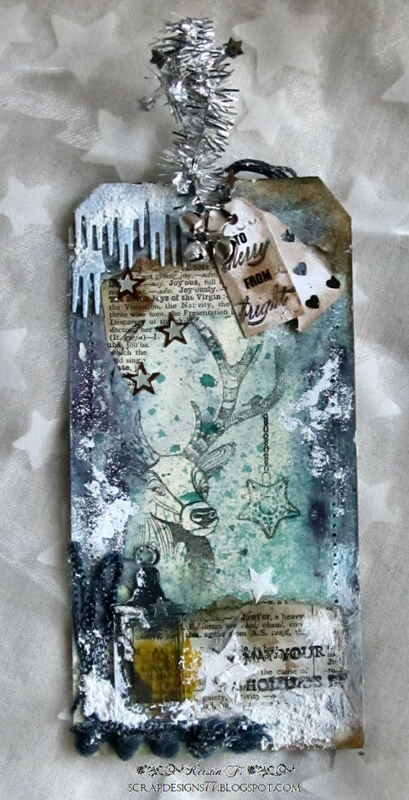 For the background I used a wonderful deer stamp, an old book page, glimmer mist sprays and a metallic acrylic paint, not to forget a distress ink (Walnut Stain from Ranger) for an altered effect. 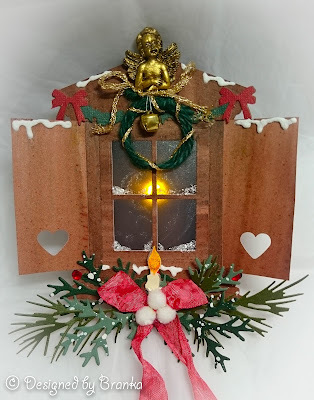 On the left corner you will see a christmas lantern (it's a foil chip from Tatterd Angels), painted with Snow Tex from DecoArt together with a pom pom ribbon. On the upper edge an icicle die with textured paper. With two little tags To - From and small silver bells I finished my gift tag. 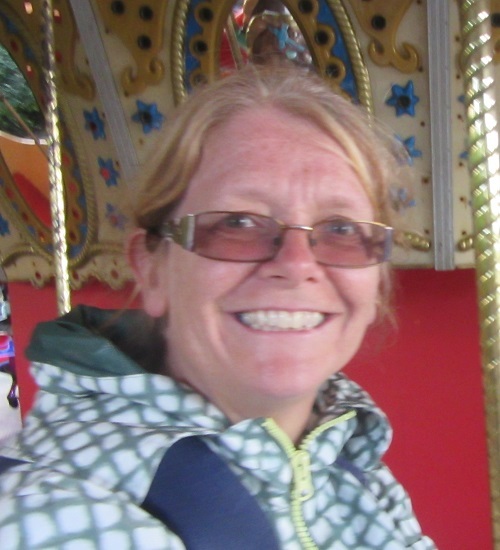 If you would like to know more about my creative world just pop over to my blog at Scrapbook Dreams. I would love to see you there! Huge thanks to the Design Team for inviting me to be their guest this month." Autumn here with you today to share a fun tutorial on using silhouette stamps for making tags for gift bags. Follow this simple process to achieve dynamic layered mixed media creations. 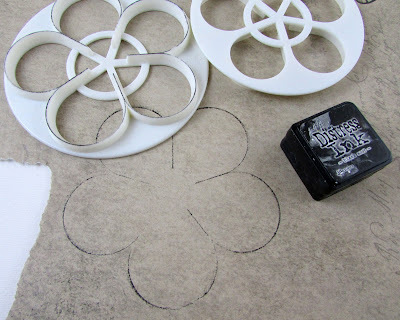 Step one: Stamp, stencil and splatter! To begin, dip your tags into lightly misted Distress Ink pools on your craft mat. 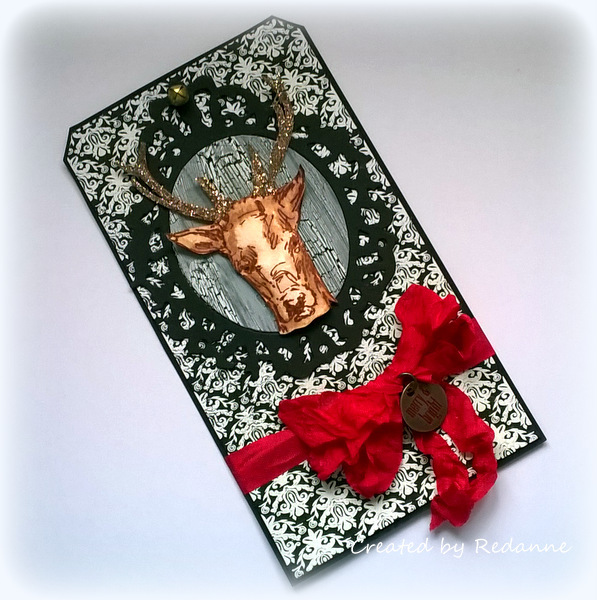 Here I've shown three color options for your Christmas tags. Next, stamp onto your backgrounds to add a subtle pattern. 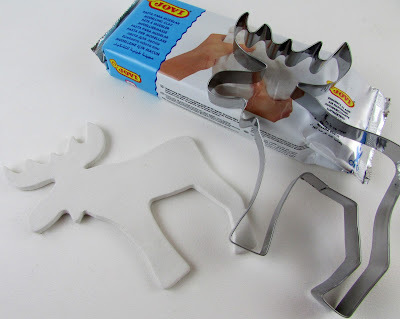 I used music and snowflake stamps, embossing the snowflakes. I added several stencil variations. On the red tag I stenciled a dot pattern and embossed it with glittery gold embossing powder. On the green tag I used gold texture paste. On the white tag I poured Distress Rock Candy glitter onto my wet paste for a soft shimmer of the dots. Step two: Add a bow cluster! I attached a coordinating bow around each of my tags near the base. I tied one strip of ribbon around the tag, then adhered my loopy bow made with a bow maker. Step Three: Silhouettes, sentiments and frames. I stamped each of my silhouettes in black for a dramatic effect onto coordinating inky paper. I layered the silhouette stamped images over frame die cuts. This one was simply painted black. I used the same gold texture paste here to add coordinating color to my frame. Each sentiment was added in a different way, this one onto inky paper with a curl for dimension. This die was coated with crackle paste. Each tag has a jingle bell. This one has a layer of cheese cloth. Finally, I tied my tags to a kraft bag and added coordinating tissue. I hope you'll take some time to try these simple tips for creating a set of gift tags of your own.